The quoits (rings) and other steel mounts on this turban are associated with Sikhs known as Akalis. The term derives from ‘Akal’, the ‘Timeless One’ – an attributive name of God. Members of the sect are also known as Nihangs, from the Persian word meaning ‘crocodile’, signifying qualities of ferocity and fearlessness. The Akalis are an order of armed fighters among baptised Sikhs. This assemblage seems to have been put together for display rather than for wearing, which may suggest it was collected by a European in the Panjab. The frame is made of wicker covered with cotton in a form resembling the high turbans worn by Akali Sikhs, but is too small in circumference and too unstable for wearing. The form and symbolism of the Akali turban (bunga dastar) originate in ancient Indian mythology. The shape is a shrine of the seventh and highest energy centre in the body. A real turban would be tied in two stages, starting with the farla or under-turban, which signifies high rank among the Akalis. 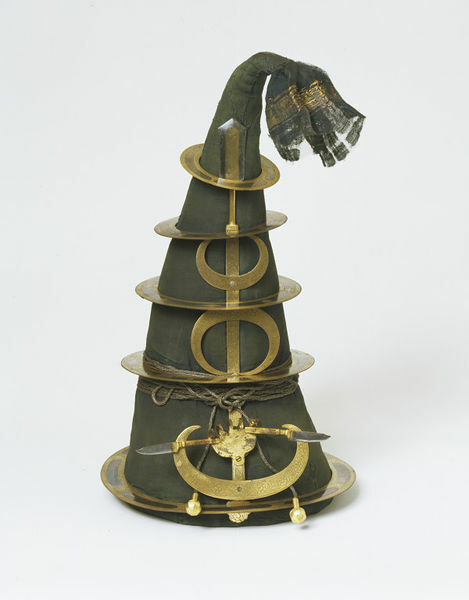 The weaponry on the turban includes a central ornament of crescents – a symbol of the Hindu God Shiva – surrounded by gold-overlaid throwing quoits (chakkar or chakra). The chakkar symbolises the cyclical nature of life and is repeatedly used in Sikh symbolism. Akali turban; cotton wrapped over a wicker frame, with quoits and other embellishments of watered steel overlaid with gold. Formerly in the collections of the India Museum and transferred to the South Kensington Museum in 1880. 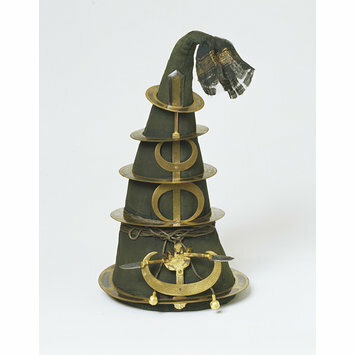 Akali turban; cotton over a wicker frame, with quoits and other embellishments of steel overlaid with gold; Lahore, Pakistan; mid-19th century. Susan Stronge, ed., The Arts of the Sikh Kingdoms, V&A Publications, 1999, cat. 112 p. 223 and p. 142, pl. 162.